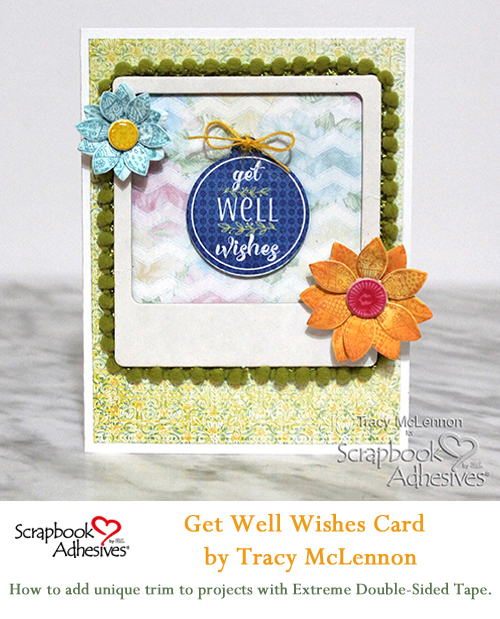 Welcome back crafty friends, Tracy here and today I have a fun and quick little tutorial to share on how I created this Get Well – Pom Pom Card. 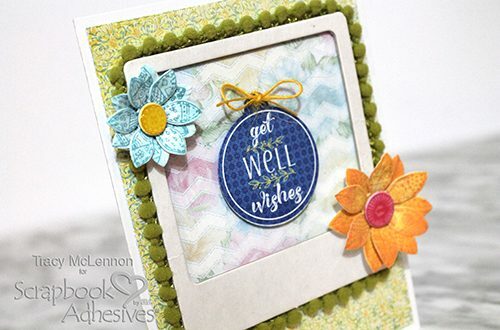 I love to add fun texture and dimension to my projects with pretty ribbon and trim. I want to share a couple of tips on how to do just that. 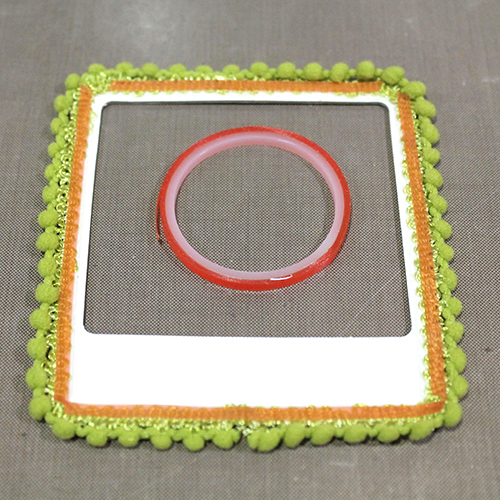 I started with a plain white chipboard frame, and the pom pom trim I wanted to use. When it comes to anything trim or ribbon, I turn to Extreme Double Sided Tape. 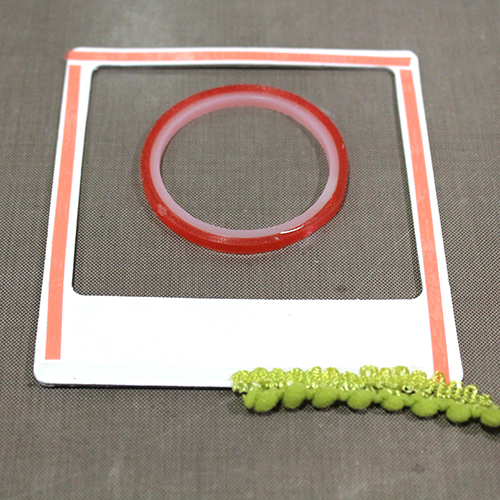 Using this tape will ensure that my textured pieces stay in place. 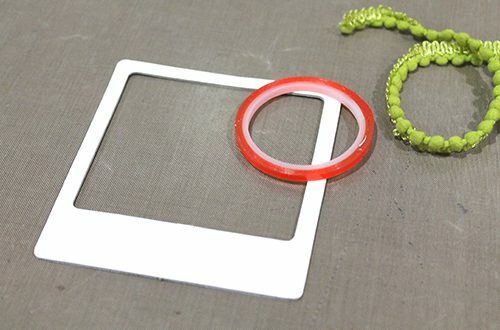 Using Extreme Double Sided Tape 1/8″, I taped the edges of the chipboard frame. I started adding the trim at the bottom of the chipboard frame. Tip: If you ever anticipate imperfection, like the beginning and end of this trim, Place it at the bottom of a project. The eye is less likely to notice it there. 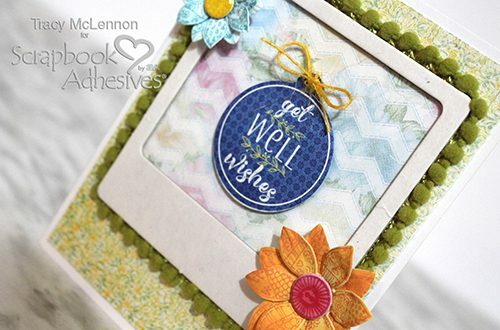 Continue around the entire chipboard frame, one section at a time. Then I added another layer of Extreme Double Sided Tape to adhere the back side of the trim to the patterned paper in the next step. I cut a piece of patterned paper to fit on the back side of the chipboard frame. 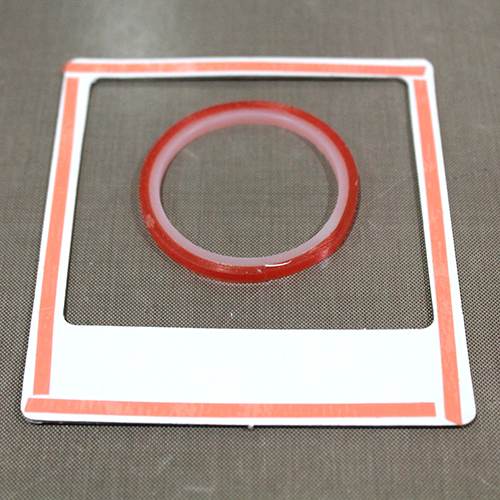 The Extreme Double Sided Tape keeps it in place. 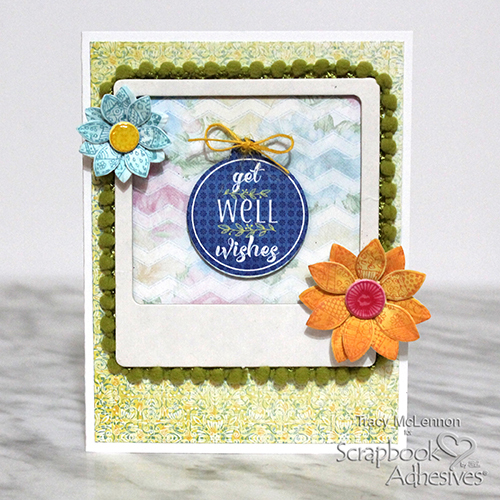 Using the E-Z Runner® Permanent Strips Refillable Dispenser I added the yellow patterned paper to the card base. 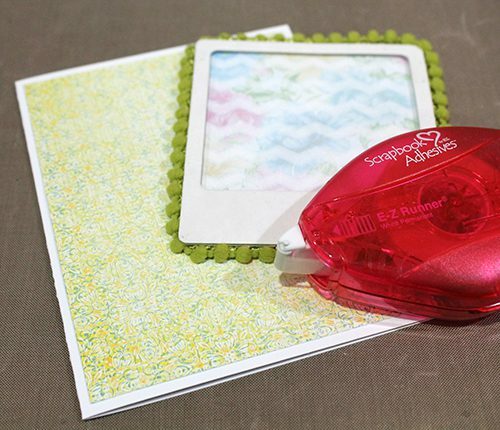 Adhere the pom frame to the card using the E-Z Runner® Permanent Strips Refillable Dispenser. 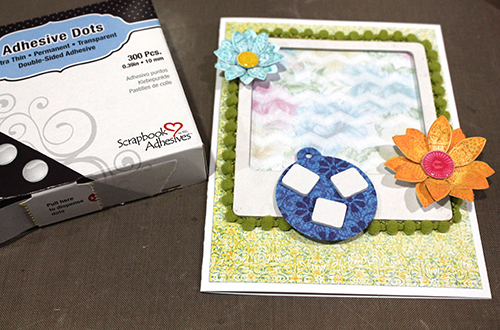 The paper flowers were added to the card using Adhesive Dots and the sentiment tag was added to the card using 3D Foam Squares. I added a burlap string bow to the tag as a finishing touch. This entry was posted in 3D Foam Squares, Adhesive Dots & Lines, Adhesives, Cards, Crafts & Tutorials, E-Z Runner® Dispensers, Embellishments, Extreme Double-Sided Tapes, Intermediate, Permanent Adhesive, Skill Level, Tutorial and tagged 3D Foam Squares Mix White, 3D Foam Squares Regular White, Adhesive Dots Medium, Card, Card Making, E-Z Runner Permanent Strips, E-Z Runner Permanent Strips Refillable Value Pack, Extreme Double-Sided Tape 1/8", Get Well, HomeHobby by 3L, May Arts Ribbon, Ribbon, Tracy McLennon, Tutorial. Bookmark the permalink.